Nitrile unlined gloves, nitrile flock lined gloves, chemical resistant gloves, disposable gloves, protective workwear. 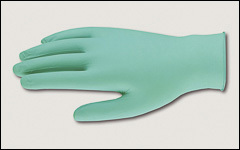 Nitrile gloves are great alternatives for persons with latex allergies. Permeation and degradation data is available to assist those qualified in determining general suitability of these gloves to your application. Other gloves are shown on our Abrasion resistant gloves and Latex and neoprene gloves pages. Glove liners are shown on our Glove liners page. 4 mil West Chester 2900 is a lightly powdered, industrial grade, blue nitrile ambidextrous glove. Improved puncture and resistance over thin latex and vinyl gloves. Snug sensitive fit and maximum dexterity. Loose fit around wrist with rolled cuff. Comply with FDA food handling requirements. 9 1/2" long. Sold by the box, 100/box. 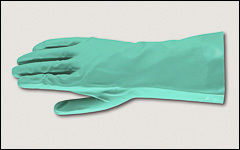 Ansell 92500 is a lightly powdered teal nitrile ambidextrous glove. This Touch-N-Tuff is one of the best disposable nitrile gloves you can buy. Glove provides superior chemical resistance and up to three times the puncture resistance of latex or vinyl gloves. Beaded cuff and static-dissipative. Comply with FDA food handling requirements. 9 1/2" long. Sold by box, 100/box. 15 mil West Chester 33418 is a flock lined green nitrile glove. Protects from chemicals, oils, acids, solvents and caustics. Offers superior snag and puncture resistance over rubber and neoprene gloves. 13" long. Small size is packaged differently; each pair is bagged. Sold by the dozen, 12 dozen/case.